Fall is my favorite time of year. I love the organic colors associated with the season. Beautiful burnt orange, mellow browns and shades of gold all tell us that fall is here! Not to mention bonfires, hot chocolate and the brisk cold air that are signs that fall is upon us! At last some relief from the hot temperatures and extreme humidity that is found in my area of the country. Make some crafts that celebrate this lovely season. 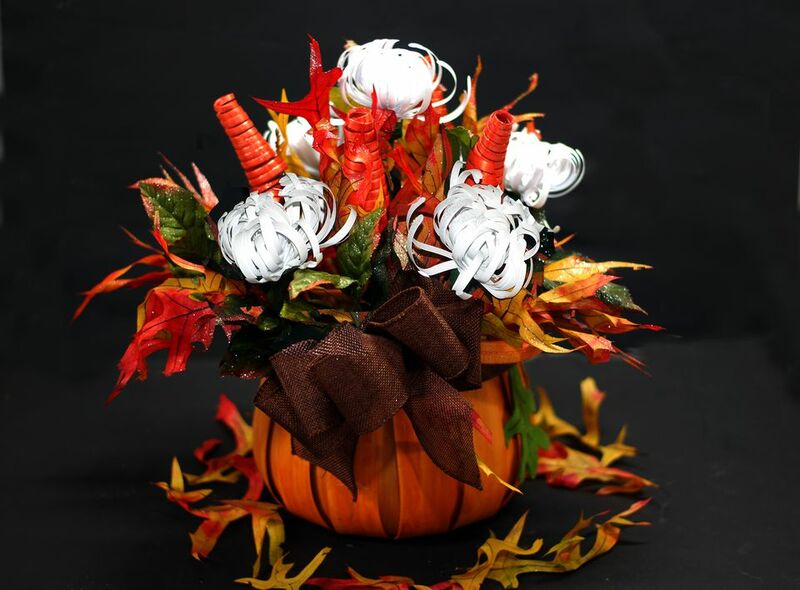 Mums are flowers that bloom in fall, so why not make some in paper. These flowers will last a lot longer than real ones and you don't have to water them! You will love this paper craft project so much, you will want to make a couple for your friends and family too! Make a beautiful fall flower arrangement to decorate your dining or coffee table. The arrangements are made from paper flowers, silk leaves and preserved oak leaves. The brown and orange colors will bring a festive holiday mood to your home decor, and warmth to the holiday season.The floral arrange will work well as home decor for both Halloween and Thanksgiving. Cut the dry floral foam with a sharp knife to fit the decorative basket making sure it is level with the top of the basket. Place the floral foam firmly down with your hands into the wicker basket. If you desire extra adhesion, you may use hot glue to secure floral foam to the bottom of the basket. Place the mums securely into the foam as in the photo above. One mum should be in the center of the foam, with the other four mums place equidistant into the four corners to form a square. The spider mum in the middle should be a bit taller than the other four spiders mums. Tip: Secure the flowers to the floral foam with a bit of hot glue on the base of the flower stem. Cut four curly spikes to size with floral cutters and insert the stems evenly around the center spider mum as in the photo above. The curly spikes should be a bit lower than the center mum, but taller than the other mums. Insert the green silk leaves as filler around the flowers and curly spikes. The fillers and flowers should now form a mound shape. To add length and strength to the silk leaves, run a floral wire through the bottom portion of the leaf, twist together, and wrap with floral tape, then insert the leaf into the dry floral foam. Add preserved oak leaves as filler. Try to make sure that both the silk leaves and the oak leaves are covering the empty spaces evenly on all sides of the floral basket. If you need to add fake stem to the oaks leaves, gather two or three leaves in a bunch and wrap with floral tape onto a wooden dowel. Insert the wrapped floral stem of the bow into the dry floral foam on the bottom, center of the floral arrangement. Spray the top of the arrangement with silver glitter flower spray to add some holiday sparkle and you are done! Stand back and enjoy your beautiful arrangement.